FACEBOOK HAS ANNOUNCED plans to help cut out fake advertisements on its social media platform ahead of the Eighth Amendment referendum by rolling out a new advert transparency tool next week. Ireland will be the second country worldwide, behind Canada, to receive the View Ads feature, which will be implemented for the first time here on 25 April. The tool has been fast-tracked in Ireland ahead of the upcoming Eighth Amendment referendum. View Ads will enable Irish users to gain further information about political adverts in relation to both sides of the campaign. Facebook users will be able to click on the advertisement and see all other adverts that the advertiser is running in Ireland at any particular time. However, users still won’t be able to view who paid for these ads. Facebook representatives have said the company does not have the capability to do so yet. John Kaplan, Vice President of Global Public Policy at Facebook, and Niamh Sweeney, Head of Public Policy at Facebook Ireland appeared before the Communications Oireachtas committee this afternoon over the use of social media and the influence it has on elections and referendums. Kaplan told the committee that the new ad tool will help eliminate “foreign interference” in the upcoming referendum. He said that Facebook also puts together internal task forces with representatives who “do everything they can” to detect foreign interference in elections and combat fake accounts. “We’ve had good results. In the French election, we were able to detect tens of thousands of politically motivated fake accounts. We had similar good results in Germany and Alabama,” Kaplan said. A task force has been set up by Facebook for the upcoming Eighth Amendment referendum. “We’ve stood up a team like that for the upcoming referendum. We will be deploying the artificial technologies we have developed to try to detect those fake accounts as quickly as we can,” Kaplan said. The Online Advertising and Social Media (Transparency) Bill 2017 was also at the heart of discussions this afternoon. The Bill is understood to have gotten widespread support, with the Sunday Business Post reporting at the weekend that the government’s parliamentary legislation drafters have given the Bill the green light. Fianna Fáil’s James Lawless has already met with Facebook about the issue and spoke to the committee this afternoon about his Bill. “The Irish Electoral Acts were written largely in 1992, that was before the internet, broadband and certainly social media. They do not cover the online space at all,” he said. Speaking to TheJournal.ie yesterday, Lawless said that as legislators it is their job to ensure there are appropriate safeguards. Lawless said he would not accept the argument from social media companies that they are working behind the scenes on the issues involved. 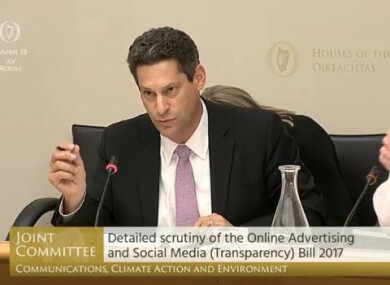 In relation to the Bill, Kaplan said in his opening statement: “It mirrors, in large part, what we are trying to achieve with the new ads transparency tools we have announced. Facebook believes up to 87 million people’s data was improperly shared with the political consultancy firm Cambridge Analytica. The Facebook representatives told the committee that while most of the people impacted by the data breach were predominantly in the US, up to 44,687 people in Ireland may have been impacted. Kaplan echoed what CEO, Mark Zuckerberg said in front of a US committee last week that “what happened with Cambridge Analytica represents a huge violation of trust, and we are deeply sorry”. “It’s clear now that we didn’t do enough to prevent these tools from being used for harm as well,” Kaplan said. “We didn’t take a broad enough view of our responsibility, and that was a mistake. It’s not enough to give people control of their information, we have to make sure that developers who get users’ consent to access data are protecting it too,” he said. Email “Facebook rolling out tool in Ireland to help combat fake abortion referendum advertisements”. Feedback on “Facebook rolling out tool in Ireland to help combat fake abortion referendum advertisements”.